Carries 48.6 cu.-ft. of cargo behind the rear seat; maximum is 90.4 cu.-ft.
After a year of teasing luxury SUV buyers with concept vehicles and images of heavily camouflaged test vehicles, BMW has officially revealed the 2019 X7. 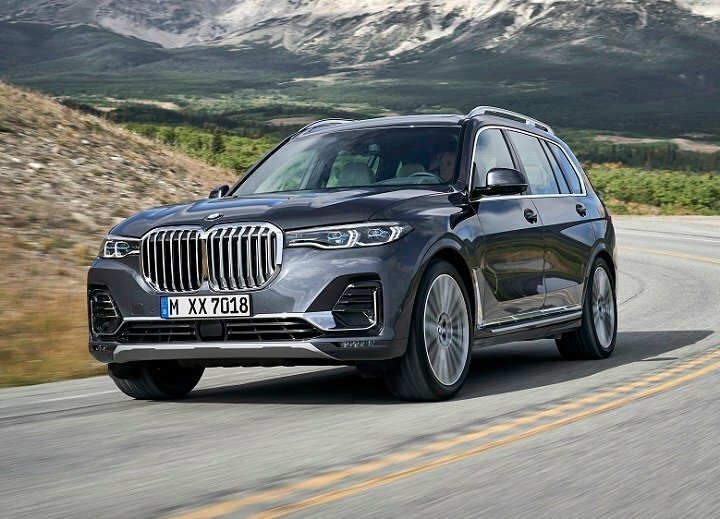 A 7-passenger SUV, the new BMW X7 will be sold in xDrive40i and xDrive50i model series when it goes on sale in March of 2019, priced from just under $75,000. Customers can, however, pre-order the X7 now, ensuring that they’ll be one of the first to get BMW’s big new baby when it starts rolling off the Spartanburg, South Carolina assembly line. Measuring 9 inches longer, 0.2 inch narrower, and 2.1 inches taller than a BMW X5, the new X7 sits on a 5.1-inch longer wheelbase and weighs 557 pounds more than its smaller sibling. Boldly defined BMW design cues decorate the X7’s exterior, from the largest kidney grille in history to the classic Hofmeister kink forward of the rear roof pillar. A set of 21-inch aluminum wheels is standard, along with adaptive LED headlights with automatic high-beam operation. The X7’s rear doors are longer than the front doors. BMW says this makes it easier to get into and out of the second- and third-row seats. That might be true when you’re parked in your McMansion’s wide driveway or when the valet brings the X7 to the porte cochere, but in a parking lot the design could make loading kids quite tricky. You don’t get standard leather upholstery in the X7 xDrive40i. BMW’s SensaTec leatherette awaits up to seven derrieres. Leather is optional for this version of the X7, and standard for the xDrive50i. Premium leather, extended leather, a leather dashboard, and an Alcantara suede headliner are options for a cabin decked out in wood trim and electroplated accents. A 4-zone climate control system and a 3-panel panoramic glass roof are standard, and all seating locations feature power adjustment. The driver can control second-row seat fore/aft adjustment, sliding it forward and back through 5.7 inches of travel. BMW promises that adults will be comfortable in the third-row seat. Open the power-operated, 2-section split tailgate, and both rear rows of seats can be power folded and raised from the cargo area. The X7 provides 48.6 cubic-feet of cargo space behind second row, and maximum volume measures 90.4 cu.-ft., according to BMW. Push a button inside the cargo area and the standard air suspension lowers the X7 by 1.6 inches for easier loading. As an option, buyers can equip the X7 with second-row captain’s chairs offering the same range of power adjustment as the front seats. Ventilated and massaging front seats are also on the optional equipment list, along with 22-inch wheels, towing equipment, and more. An Off-Road Package with off-road driving modes helps a BMW X7 owner to maximize the SUV’s 8.7 inches of ground clearance, while a Dynamic Handling Package upgrades the vehicle predictive active roll stabilization, speed-dependent active steering, M Sport braking components, and, on the xDrive50i, an M Sport rear differential. Additional option packages include the Cold Weather Package (5-zone climate control, heated front and rear seats, heated front armrests, heated steering wheel), and the Premium Package (remote engine start, soft-close doors, power rear side window shades, heated and cooled cupholders, head-up display, gesture control, Harman Kardon premium sound). The Harmon Kardon audio system is standard for the X7 xDrive50i, which is exclusively offered with an Executive Package containing BMW Laserlight headlights, an LED Sky Lounge roof lighting that can turn the panoramic glass sunroof into a constellation of stars, and glass controls for the cabin. The X7 xDrive40i has a turbocharged 3.0-liter 6-cylinder engine. It makes 335 horsepower from 5,500 rpm to 6,500 rpm, and 330 lb.-ft. of torque from 1,500 rpm to 5,200 rpm. BMW quotes an acceleration time of 5.8 seconds to get to 60 mph. The X7 xDrive50i features a twin-turbocharged 4.4-liter V8 engine. It generates 456 hp from 5,250 rpm to 6,000 rpm, and 479 lb.-ft. of torque from 1,500 rpm to 4,750 rpm. It takes 5.2 seconds to run this version of the SUV from rest to 60 mph, according to BMW. Both engines feature smart automatic engine stop/start, an 8-speed sport automatic transmission with a new transmission gear selector design, a next-generation xDrive all-wheel-drive system, and a Driving Experience Control system with multiple drivetrain settings. Both the engine stop/start system and the transmission rely on the X7’s navigation data and various radar and camera units to maximize efficiency and driving satisfaction. A self-leveling air suspension is standard, equipped with Dynamic Damper Control. In Sport mode or when the X7 is driven at higher speeds, the SUV automatically lowers by nearly an inch for improved stability. Drivers can also manually raise the suspension by 1.6 inches for maximum off-roading capability. The total range of adjustment range is 3.2 inches from the lowest to the highest setting. When properly equipped, the new BMW X7 tows up to 7,500 pounds. In addition to a reversing camera and front and rear parking sensors, the BMW X7 is equipped with an Active Protection and Active Driving Assistance suite. It contains forward collision warning with pedestrian/cyclist detection and automatic emergency braking, rear collision warning, blind spot monitoring, rear cross-traffic alert, lane departure warning, and a speed limit information system. Optional for the X7 xDrive40i and standard for the X7 xDrive50i, the Active Driving Assistant Professional suite takes things several steps further. It installs an adaptive cruise control system with stop-and-go capability, an active lane keeping assist system with automatic lane change capability, an active side-collision protection system, and a front cross-traffic alert system. Additionally, this package adds Evasion Aid, which can help to ensure a safe emergency maneuver when taking sudden action to avoid an obstacle, and an Emergency Stop Assistant, which is used in case of a sudden medical emergency to bring the X5 to a safe stop and activate both the hazard lights and the BMW Assist Intelligent Emergency Call function. Active Driving Assistant Professional also includes an extended traffic jam assist function that doesn’t require a driver to regularly grasp the steering wheel when traveling in traffic at less than 37 mph. Fully automated parallel parking capability is also a part of this package. Every 2019 X7 will have BMW Live Cockpit Professional, which includes a 12.3-inch digital instrumentation display and a 12.3-inch iDrive 7.0 infotainment system touchscreen display. Like other recent BMWs, the instrumentation ditches the company’s traditional round gauges for digital speedometer and tachometer bands on either side of the display. This design allows more data to be shown in the center of the screen. The iDrive display offers up to four different owner-selected layouts and what BMW claims are “stunning visualizations.” The X7’s version of iDrive features a new haptic controller, cloud-based voice control, wireless device charging, and a Wi-Fi hotspot. Gesture control is available as an upgrade. The system is also designed to allow owners to transfer their cloud-stored preferences to other BMW models. A Harman Kardon premium sound system is optional for the xDrive40i and standard for the xDrive 50i. A further upgrade, a Bowers & Wilkins audio system features 1,500 watts of power and 20 speakers. An optional Rear Seat Entertainment Professional system equips the X7 with dual 10.2-inch high-definition display screens, a Blu-Ray player, HDMI input jacks, and two headphone jacks. Front seat occupants can control the system, or the rear seat occupants can select their own entertainment. Navigation Professional is standard, a hard-drive system with 20GB of memory, six USB ports, and applications for news, weather, and online search. BMW ConnectedDrive integrates a smartphone or smartwatch with the vehicle, and is compatible with Alexa and Google Home. Connected Package Professional adds remote services, concierge services, on-street parking information, and real-time traffic information. It is free for the first four years of ownership, and then it requires a paid subscription. BMW Intelligent Personal Assistant technology learns the X7 owner’s routines and preferences, can answer questions about how the vehicle or the onboard technology works, and can even adjust vehicle settings and entertainment to driver’s stated mood. For example, a “Hey BMW, I feed tired” command changes the cabin in a way designed to promote alertness. BMW Digital Key turns your smartphone into a key, locking and unlocking the SUV, and starting and turning off the X7’s engine. Know, however, that it is only compatible with Samsung Galaxy smartphones with Near Field Communications capability, and running Android 8.0 or higher. Parking Assistant Plus includes a 360-degree surround view camera with remote 3D viewing capability via the BMW ConnectedDrive smartphone app. An available Backup Assistant essentially retraces the exact route the X7 took into a parking space, reversing up to 50 yards along the same path.